I was at the LMS annual Pilgrimage to St Winifride's Well in North Wales yesterday, acting as subdeacon, along with Fr Edmund Montgomery from Shrewsbury Cathedral (deacon) and Fr Richard Bailey (celebrant) from the Oratorian Community at St Chad's in Manchester. The Well is a wonderful shrine, not least because of how ancient it is. The Brigittine Sisters at the now very smart Guest House supplied us with a much needed High Tea afterwards. Lovely music that lifted the heart. A splendid sermon from Fr Bailey on the virgines fatuae and the virgines prudentes, encouraging us to be among the prudent rather than the fatuous, of course. 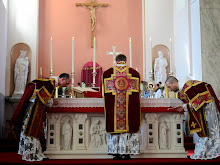 My thanks for the many photographs courtesy (and copyright) of Mike Barnsdall, showing the Mass and the Procession to the Well, along with the Veneration of the Relic.